Mesh networking is a new topology available for Bluetooth Low Energy (BLE) devices that enables many-to-many (m:m) communications. It's optimized for creating large-scale node networks and is ideally suited for building automation, sensor networks, and asset tracking solutions. More detailed information about Bluetooth Mesh is available in Bluetooth SIG's introduction to Bluetooth Mesh and the Bluetooth Mesh Networking Specifications. The nRF5 SDK for Mesh is Nordic Semiconductor's implementation of the Bluetooth Mesh. It allows applications to use the features provided by the Bluetooth Mesh when running on Nordic's nRF5 Series chips. 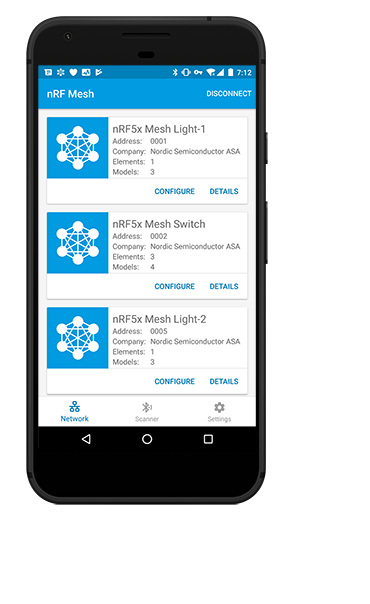 See nRF5 SDK for Mesh Documentation for more information. The nRF5 SDK for Mesh now requires the nRF5 SDK to compile. 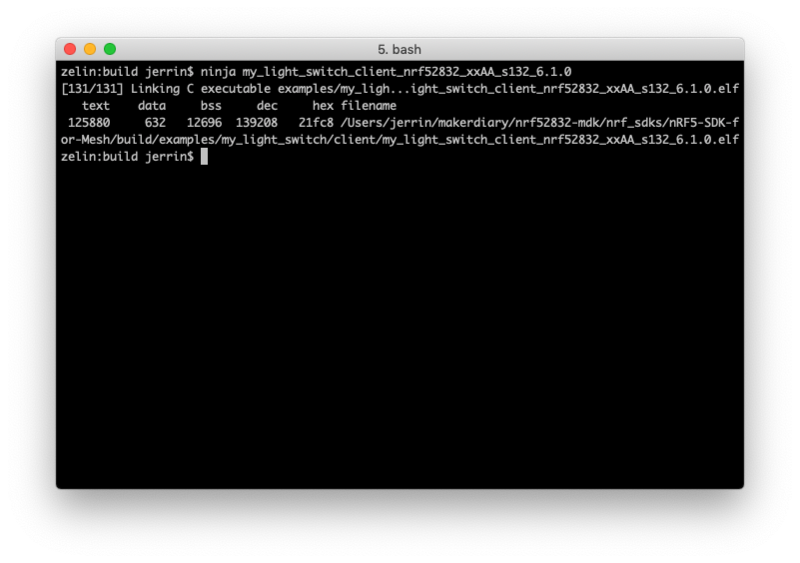 Follow this instruction to Install the nRF5 SDK. 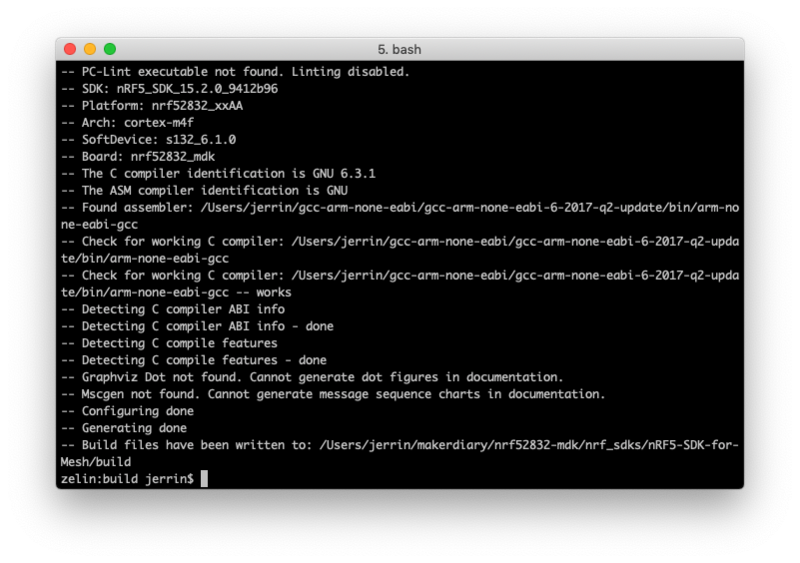 Before you can build with Ninja, you must generate the correct build files with CMake. cmake -G Ninja -DTOOLCHAIN=gccarmemb -DPLATFORM=nrf52832_xxAA -DBOARD=nrf52832_mdk -DFLASHER=pyocd ..
cmake -G Ninja -DTOOLCHAIN=gccarmemb -DPLATFORM=nrf52840_xxAA -DBOARD=nrf52840_mdk -DFLASHER=pyocd ..
After connecting the board to your computer, run ninja flash_<target> to flash the example. To participate in mesh communication, each device must be provisioned. Provisioning is the act of adding a device to a mesh network. Through the provisioning process, the new device receives a range of addresses, a network key, and a device key. For a detailed guide on how to use provisioning, see Mesh Provisioning. Launch the nRF Mesh mobile app. In Scanner tab, several mesh nodes will be discovered: The client board is nRF5x Mesh Switch and the server board is nRF5x Mesh Light. Select the nRF5x Mesh Switch. After provisioning, you will see two Generic On Off Client model instances. Bind the instances with the same app key. Set the publish address of the first Generic On Off Client to 0xCAFE and the second one to 0xCAFF. 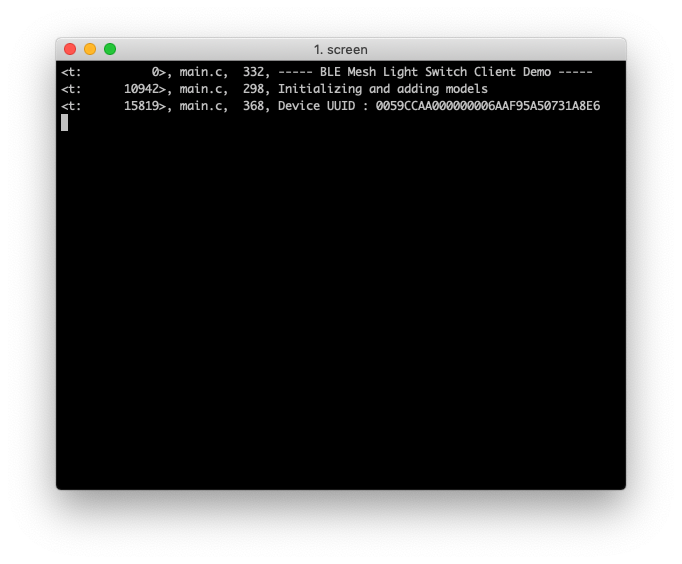 Config the nRF5x Mesh Light nodes. Bind the servers with the same app key as the client. Set the subscribe address to 0xCAFE or 0xCAFF mentioned above. Now you have built a Bluetooth Mesh with several nodes. 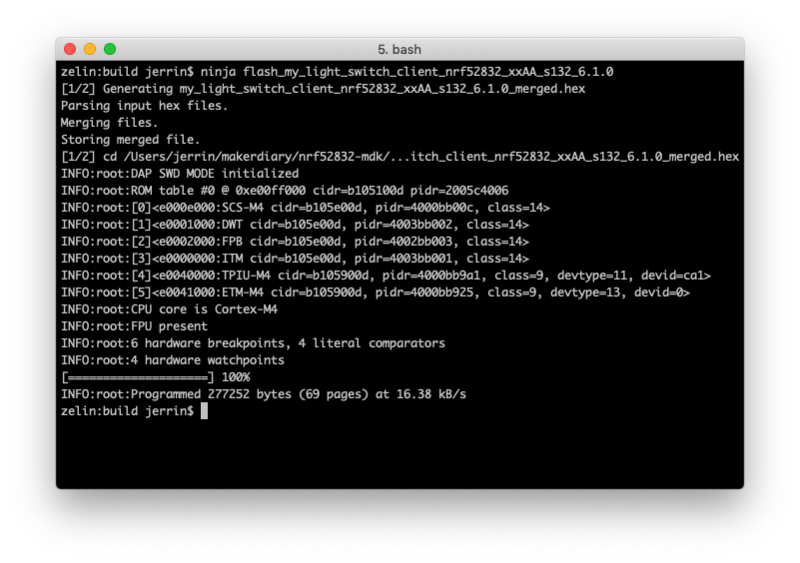 Once provisioning and configuration of the client node and at least one of the server nodes is completed, you can press buttons on the client to see the LEDs getting toggled on the associated servers. See the Bluetooth Mesh Network in action.